Ever since the day Donald Trump stormed on to the political scene, establishment Republicans worked behind the scenes to sabotage him. The backstabbing and betrayals only escalated once Trump won the election. And now Donald Trump just identified the biggest traitor in the Republican Party. During the 2016 Presidential election, Lindsey Graham emerged as one of the most vocal “Never Trumpers” in the Republican Party. Graham – who favors amnesty and endless foreign wars and is one of the biggest RINOs in Congress – immediately recognized the threat Trump’s “Make American Great Again” agenda posed to the establishment’s death grip on power. But after Trump won, Graham tried a different tactic. Graham tried to flatter President Trump on his judicial picks – even RINOs like Mitt Romney, John McCain and Jeff Flake backed the President’s judicial nominees – to influence Trump on foreign policy. Establishment Republicans figured Trump had no real beliefs of his own and if they buttered him up, they could push him to abandon his “America First” foreign policy. They ended up with egg on their face when President Trump ordered an end to Barack Obama’s disastrous Syrian war by ordering all 2,000 American troops home by April 30. Graham pressed Patrick Shanahan, the President’s acting Secretary of Defense, at the Munich Security conference to abandon Trump’s commitment to put the troop’s safety and security as his top priority. The South Carolina RINO berated Shanahan over Trump’s sensible decision to end Barack Obama’s worst mistakes. “That’s the dumbest f—ing idea I’ve ever heard,” Graham responded. Senator Graham then rattled off a laundry list of every globalist’s “doomsday scenario” of overhyped consequences of the United States acting in its own interest instead of the New World Order’s. Shanahan replied that anything could happen, treating Graham’s fear mongering as the equivalent of someone being afraid to leave their house because a piano might fall out of the sky and crush them. Graham then threatened President Trump’s acting Secretary of Defense. 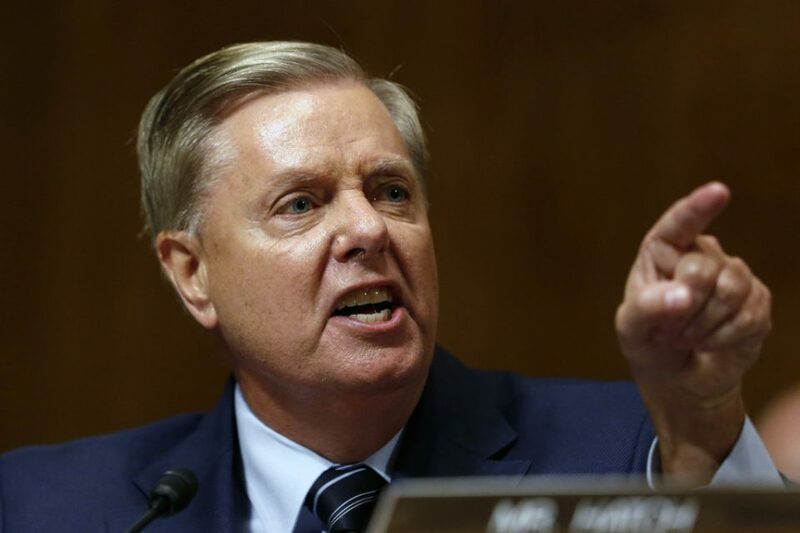 “Well, if the policy is going to be that we are leaving by April 30, I am now your adversary, not your friend,” Graham shot back. New Jersey Democrat Senator Robert Menendez – who is lucky not to be in jail on corruption charges – backed up Graham. Graham revealed himself to be the biggest false friend President Trump has in the GOP. The South Carolina RINO only pretended to support the President or back his agenda as long as there was a payoff in the end for Graham. When it became clear that Trump was committed to keeping his pledge to the American people to end foreign wars, Graham turned his back on the President.